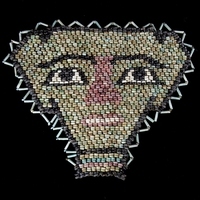 This remarkable object is a beaded funerary mask, made with multi-coloured faience beads (so-called mummy beads). As is common, the authentic ancient beads have been re-strung into original configuration. The mask would have been placed over the facial area of the mummy and depicts the deceased wearing the beard of Osiris. Zig-zag border around.